أَسْتَوْدِعُكُمُ اللهَ الَّذِي لَا تَضِيعُ وَدَائِعُهُ. I leave you in the care of Allah, Who does not allow anything entrusted to Him to be lost.1Ibn as-Sunni (506), an-Nasā’ī (508), and al-Futūhāt (5/114). Ibn Hājar states that this is a ḥasan hadith. There are three supplications that will undoubtedly be answered: the supplication of one who has been wronged, the supplication of the traveller, and the supplication of a father for his child. أَسْتَوْدِعُ اللهَ دِينَكَ وَأَمَانَتَكَ وَخَوَاتِيمَ عَمَلِكَ زَوَّدَكَ اللهُ التَّقْوَى وَغَفَرَ ذَنْبَكَ وَيَسَّرَ لَكَ الْخَيْرَ حَيْثُ كُنْتَ. Astawdi’u-llāha dīnaka wa amānataka wa khawātīma amalik. Zawwadaka-llāhu-t-taqwā. Wa ghafara dhanbak. Wa yassara laka-l-khayra ḥaythu mā kunt. I entrust your religion, your integrity and your final deeds to Allah’s protection. May Allah grant you taqwa, forgive your sins and facilitate goodness for you, wherever you are.2At-Tirmidhi (3439), Ibn Majah (2826), and al-Futuhat (5/118). This hadith is hasan due to its supporting narrations. Abu Dawud (2601), Ibn as-Sunni (505), and an-Nasa’i (507). At-Tirmidhi (3440). Ibn Hajar grades it as hasan. اَللَّهُمَّ اطْوِ لَهُ الْبُعْدَ وَهَوِّنْ عَلَيْهِ السَّفَرَ. Allāhumma-ṭwi lahu-l-buda wa hawwin ‘alayhi-s-safar. O Allah, shorten the distance for him and make the journey easy for him.3At-Tirmidhi (3441), Ibn Majah (2771), and al-Hakim in al-Mustadrak (2/98), who grades it as sahih; and adh-Dhahabi agrees. Before leaving the house, perform two rak’ahs of salah to protect you from harm during your journey. When you intend to leave your house, then perform two rak’ahs of salah. These (two rak’ahs of salah) will safeguard you from a harmful exit. When you enter your house (after the journey, then again) perform two rak’ahs of salah. These (two rak’ahs of salah) will safeguard you from a harmful entry. No-one has left his family with anything better than two rak’ahs that he performs among them when he intends to travel.”4Al-Futuhat (5/105-107). Ibn Hajar mentioned that this hadith was reported in at-Tabarani’s work al-Manasik. There is some weakness in its chain but it is raised to the level of hasan by other supporting narrations. According to some scholars, it is recommended to to recite Surah al-Kafirun (Qul Yā Ayyuha-l-Kāfirūn) in the first of these, after al-Fatiha, and Surah al-Ikhlas (Qul Huwa-llāhu Ahad) in the second. Others say Surah al-Falaq (Qul A‘ūdhu bi-Rabbi-l-falaq) should be recited in the first rak’ah and Surah al-Nas (Qul A’ūdhu bi-Rabbi-n-nās) in the second. After saying salam, the Verse of the Throne (Ayatul Kursi) should be recited. It has been reported that whoever recites this before leaving the home will not be afflicted with anything that he dislikes until he returns.5Al-Futuhat (5/108). Ibn Hajar said he could not find a source for this hadith with this specific wording. However, the meaning of it is mentioned in a gharib hadith whose chain contains some weakness, which was reported by Ibn as-Sunni, al-Bayhaqi in ash-Shu’ab and Abu ash-Shaykh in Thawab al-‘amal. I was fearful, so I went to al-Qazwini and asked him for a dua. He told me: ‘Whoever wants to travel and fears an enemy or loneliness should recite Li-īlāfi Quraysh, for it is security from all evil.’ I recited it and no incident has befallen me until now. اللَّهُمَّ إِلَيْكَ تَوَجَّهْتُ، وَبِكَ اعْتَصَمْتُ، اللَّهُمَّ اكْفِنِي مَا هَمَّنِي وَمَا لَا أَهْتَمُّ لَهُ، اللَّهُمَّ زَوِّدْنِي التَّقْوَى، وَاغْفِرْ لِي ذَنْبِي، وَوَجِّهْنِي لِلْخَيْرِ أيْنَمَا تَوَجَّهْتُ. Allāhumma ilayka tawajjaht, wa bika-‘taṣamt. Allāhumma-kfinī mā hammanī wa mā lā ahtammu lah. Allāhumma zawwidni-t-taqwā wa-ghfir lī dhanbī, wa wajjihnī li-l-khayri aynamā tawajjaht. O Allah, to You I turn, and to You I hold fast. O Allah, be my sufficiency for that which preoccupies me and that which does not preoccupy me. O Allah, provide me with fear of You, forgive me my sins, and turn me towards good wherever I may turn.6Ibn as-Sunni (496) and al-Futūhāt (5/11). Ibn Hajar states that this hadith is gharib, and goes on to mention certain weaknesses in its chain. Bismillāhi tawakkaltu ‘ala Allāhi lā ḥawla wa lā quwwata illā billāh. In the Name of Allah. I put my Tawakkul (trust; reliance) in Allah. There is no power and no might except with Allah. Allāhumma innī a’ūdhu bika an aḍilla aw uḍall, aw azilla aw uzall, aw aẓlima aw uẓlam, aw ajhala aw yujhala ‘alay. O Allah, I seek protection in You from misleading (others) and from being misled; from causing others to err and from being caused to err; from wronging and oppressing others and from being wronged or oppressed; from behaving with ignorance or (meeting those who) behave with ignorance. Make sure you give some charity before you leave. There are a number of supplications you should try to recite at various junctures during your journey. At the very least you should say “Bismillah” when boarding your conveyance and “Alhamdulillah” when seated. Travelling is a kind of torture as it prevents one from eating, drinking and sleeping properly. So, when one’s needs are fulfilled, one should return quickly to one’s family. Shorten the obligatory prayers consisting of four rak’ahs to two rak’ahs, which is known as qasr (Arabic: قصر ). This applies only if you’re praying alone or leading the prayer yourself. Combine prayers, which is known as jama’ (Arabic: جمع). This is not applicable to Hanafis. According to the Hanafi school of thought, you are deemed a traveller when you intend to travel 81 kilometres from your place of residence. These dispensations will apply as soon as you leave the boundaries of your hometown. And when you (Muslims) travel in the land, there is no sin on you if you shorten your Salah (prayer) if you fear that those who commit Kufr (disbelieve) may attack you; verily, the Kafirin (disbelievers) are ever open enemies unto you. The prayer while travelling is two Rakat, and Friday is two Rakat, and Eid is two Rakat. They are complete and are not shortened, as told by Muhammad ﷺ. During your journey, Asr, Maghrib and Isha salah should be shortened from four rak’ahs to two rak’ahs. This does not apply to Fajr and Maghrib Salah which remain at two and three rak’ahs respectively. The ruling of qasr does not apply to sunnah prayers, although is not sinful to omit them when travelling. Note: the two rak’ahs before Fajr and Witr were prayers that the Prophet ﷺ never omitted, even when travelling. You should continue to perform salah in this shortened manner during your Hajj or Umrah unless you intend to stay in either Makkah or Madinah for more than 15 days. If you plan to spend 13 days in Makkah and 12 days in Madinah for example, you should still shorten the prayers. When you’re in Makkah or Madinah, it is likely you will be performing salah in congregation behind the Imam. In this case, you must carry out the four rak’ah prayer fully. It is not a valid practice to break off from the congregation after the second rak’ah. Jama’ refers to the practice of combining two prayers within one prayer time. This is valid in the Shafi’i, Maliki and Hanbali schools of thought. Hanafis don’t generally follow this practice. Jama’ al-Taqdim (Arabic: جمع التقديم; “early joining”) – combining the prayers at the time of the initial prayer e.g. combining Dhuhr with Asr at the time of Dhuhr and Maghrib with Isha at the time of Maghrib. Jama’ al-Takhir (Arabic: جمع التأخير; “late joining”) – combining the prayers at the time of latter prayer e.g. combining Dhuhr with Asr at the time of Asr and Maghrib with Isha at the time of Isha. Either of these may be performed depending on your circumstances. According to the Hanafi madhhab, the only time when prayers may be combined is during the third day of Hajj in Arafat and Muzdalifah. Prayers may not be combined in any other circumstance. If you’re travelling to perform Umrah during Ramadan, fasting is optional, although it is better to fast if it does not pose undue hardship. If you choose not to fast, you must make up what you have missed at a later date. During your journey, you should try your best to observe the mandatory prayers, without inconveniencing others. Following are some tips on how to perform salah on a plane. Wash both arms (including the hands and elbows) once. Wipe at least a quarter of the head. Wash both feet (including the ankles) once. These are the obligatory actions of wudhu according to the Hanafi madhhab. This will allow you to use less water and carry it out quickly. Try not to splatter and don’t spill water on the floor to wash your feet. This may present a safety risk to other passengers. Every effort should be made to stand and face the Qibla when carrying out obligatory prayers on a flight. Airlines such as Saudia have designated areas where salah can be performed. Other airlines don’t have prayer facilities which may pose a problem. In these airplanes, standing in certain areas may pose a safety risk or be an inconvenience to others, particularly if it’s a smaller plane. There is a difference of opinion about what should be done in this scenario. Some scholars are of the opinion that it is acceptable for the prayer to be performed sitting down. Ruku (bowing) and sujud (prostration) should be gestured by bowing the head, with the sujud more pronounced than the ruku. Other scholars are of the opinion that the prayer must be performed sitting down and then be repeated after landing. It may then be advisable to take the cautious approach and perform the prayer in the best manner possible during the flight, without inconveniencing others, and repeating it when it can be performed properly. Nevertheless, you should still ask if there are any vacant spaces on the plane where the prayer can be performed. After all, the prayer itself shouldn’t take a great deal of time. Before performing salah, the direction of the Qibla must first be established. This is actually relatively straightforward as most international flights have satellite navigation devices in front of each seat which shows the direction in which the plane is travelling. Using this, it’s quite easy to deduce the direction of the Qibla. It is also generally the case that since you will be flying towards Saudi Arabia, the plane will be facing the direction of the Qibla. As for the Salah times, the beginning times of Fajr, Maghrib and Isha can be deduced by looking out of the window. When dawn breaks, Fajr begins and when the sun sets, Maghrib commences. Isha begins after the red glow of the sunset disappears. External Website: Calculate in-flight prayer times. It is perhaps more practical to get changed into your ihram clothing before boarding and then to make your niyyah (intention) to enter into the state of ihram as the designated miqat approaches. The vast majority of toilets on planes are very small so changing into your ihram in such a tight space may be a struggle. 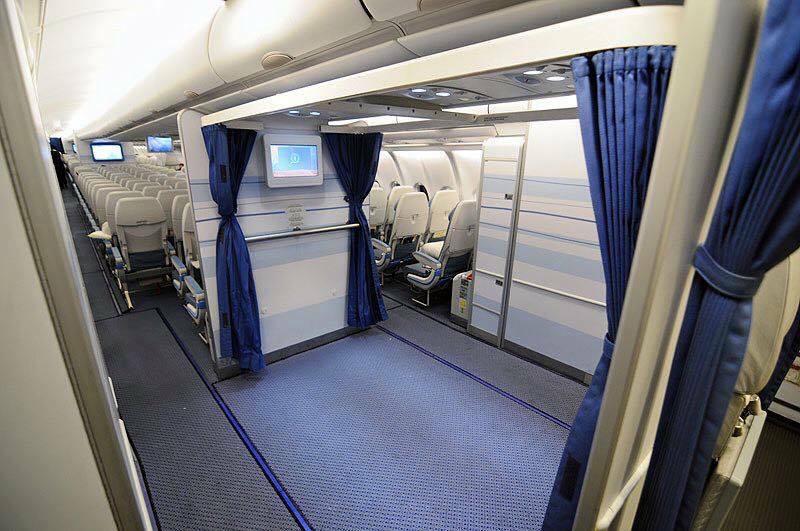 If you decide to change into your ihram clothing during your flight, your plane is likely to have a toilet with changing tables which you can use, although you will still be restricted for space. 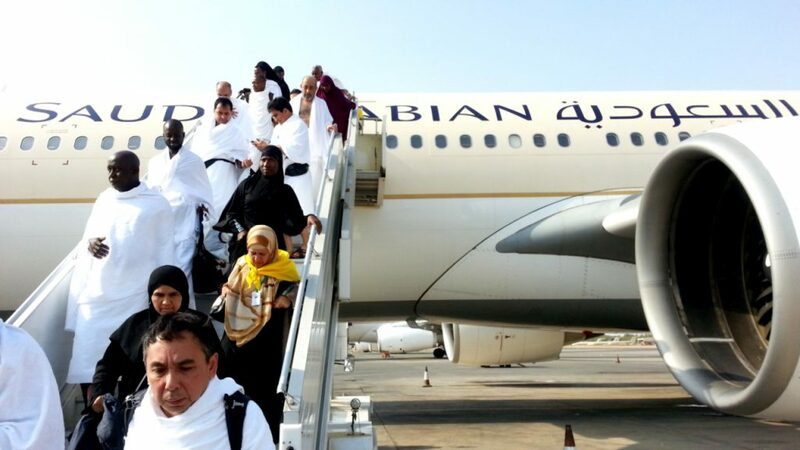 If you’re flying with an airline such as Saudia, you will have access to a small prayer area where you can put on your ihram. Ensure you get changed well before the miqat as there may well be a rush of people intending to do the same thing as the miqat approaches. When you’re ready to make your niyyah to enter into ihram, don’t forget to remove your underwear and headgear if you haven’t done so already (if you’re a male) and make sure you’re well acquainted with the restrictions of ihram. Tip: don’t forget any clothing or footwear on the plane before you disembark. It goes without saying that you should utilise your time wisely during your flight. Study your notes and guidebooks; the more you commit to memory now, the less you will have to rely on others for guidance later on. If you feel you have studied sufficiently, revise what you have learnt. Since the topic of Hajj and Umrah is so vast, it’s likely that you have missed something. If you come across something that you don’t understand, seek clarification from others around you. You should also spend time in worship, whether that is reading Quran, partaking in other forms of dhikr or sending salutations upon the Prophet ﷺ. Undertake the journey with the sole intention of seeking the pleasure of Allah. Don’t corrupt it with other intentions. Safeguard yourself against doing anything for show, pride and ostentation. Clean your heart of any ill-feeling or malice you have towards anyone. If you have wronged or usurped the rights of anyone, seek forgiveness from them and fulfil their rights. Clear any outstanding debts you have with anyone or make arrangements for their settlement. If you have usurped anyone’s wealth pay it back to them or their family. Return anything you have borrowed to its owner. Ask forgiveness for all of your sins, major and minor. Make up outstanding prayers, fasts and zakah, to the best of your ability. Learn and understand the rules and regulations of Hajj and Umrah. Take a guidebook on how to perform the rites of Hajj and Umrah. Get the blessings and pleasure of your parents before departing. Spend time with your wife and children if they’re not travelling with you. Reassure them and encourage them to be steadfast in your absence. Embrace family and friends before departure and request their duas. Make dua for those you’re leaving behind. Give charity when leaving your house. Perform two rak’ahs of salah before departure. Make dua after this salah. Travel with a righteous companion who is upright in character and encourages you to do good. Perform two rak’ahs of salah wherever you stop during the course of the journey. E.g. at your local airport, at Jeddah airport, Madinah airport, etc. Do your best to perform salah on the plane, without inconveniencing others. Remain humble and modest throughout the journey. Maintain good character throughout your journey by abstaining from getting angry, arguing, fighting, pushing, being abusive etc. Treat others with love, affection and kindness. Don’t be miserly during the course of your journey. Carry extra money with the intention of spending on the needy during your journey. Don’t bargain excessively when shopping. Remain engaged in the remembrance of Allah and his Messenger ﷺ throughout the journey and also make dua for yourself, your parents, spouse, children, and the Muslims in general. Strive to perform salah with congregation. Perform the five daily prayers at their appropriate times. Observe the sunnah and optional prayers to the best of your ability. 1. ↑ Ibn as-Sunni (506), an-Nasā’ī (508), and al-Futūhāt (5/114). Ibn Hājar states that this is a ḥasan hadith. 2. ↑ At-Tirmidhi (3439), Ibn Majah (2826), and al-Futuhat (5/118). This hadith is hasan due to its supporting narrations. Abu Dawud (2601), Ibn as-Sunni (505), and an-Nasa’i (507). At-Tirmidhi (3440). Ibn Hajar grades it as hasan. 3. ↑ At-Tirmidhi (3441), Ibn Majah (2771), and al-Hakim in al-Mustadrak (2/98), who grades it as sahih; and adh-Dhahabi agrees. 4. ↑ Al-Futuhat (5/105-107). Ibn Hajar mentioned that this hadith was reported in at-Tabarani’s work al-Manasik. There is some weakness in its chain but it is raised to the level of hasan by other supporting narrations. 5. ↑ Al-Futuhat (5/108). Ibn Hajar said he could not find a source for this hadith with this specific wording. However, the meaning of it is mentioned in a gharib hadith whose chain contains some weakness, which was reported by Ibn as-Sunni, al-Bayhaqi in ash-Shu’ab and Abu ash-Shaykh in Thawab al-‘amal. 6. ↑ Ibn as-Sunni (496) and al-Futūhāt (5/11). Ibn Hajar states that this hadith is gharib, and goes on to mention certain weaknesses in its chain.